Locate a huge collection of powerful spell tomes. Travel to Hob's Fall Cave. Locate the Ancient Tome Chest within. Once you've installed the Arcane Accessories Creation, you will receive this quest and be directed to Hob's Fall Cave in Winterhold to locate a long-lost archive of spell tomes. The cave is filled with warlock and skeleton enemies. 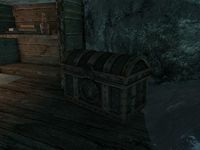 The quest marker will lead you to an "Ancient Tome Chest" in a reading area found roughly halfway through the dungeon. For more precise directions, see the dungeon walkthrough. Open the chest to complete the quest. The spells obtained from these tomes are very powerful, as they use far less magicka than anything available in the base game with the same effect. If gameplay balance is a concern, you should note that you are not required to read or even take the tomes in order to complete the quest. 0 I've heard tales of a long-lost ancient library of spell tomes, rumored to be somewhere in the area of Winterhold. I should explore the area and see what I can find. 10 Finishes quest I've found the fabled chest filled with long-lost ancient spell tomes in Hob's Fall Cave. On the PC, it is possible to use the console to advance through the quest by entering setstage ccBGSSSE014_SpellPack_StartupQuest stage, where stage is the number of the stage you wish to complete. It is not possible to un-complete (i.e. go back) quest stages, but it is possible to clear all stages of the quest using resetquest ccBGSSSE014_SpellPack_StartupQuest. This page was last modified on 24 March 2019, at 18:06.